A 2.048 Mbps circuit provides high speed, digital transmission for voice, data, and video signals at 2.048 Mbps. 2.048 Mbps transmission systems are based on the ITU-T specifications G.703, G.732, and G.704, and are predominant in Europe, Australia, Africa, South America, and regions of Asia. Due to an increase in demand for global communications in recent years, 2.048 Mbps installations in North America have risen sharply, and exist alongside the standard T-Carrier systems. The 2.048 Mbps standards are now firmly established for transmission systems and are used by telecommunications network suppliers, international carriers, and end users. The primary use of the 2.048 Mbps is in conjunction with multiplexers for the transmission of multiple low-speed voice and data signals over one communication path rather than over multiple paths. The figure shows a typical system. The most common line code used to transmit the 2.048 Mbps signal is known as HDB3 (High-Density Bipolar 3) which is a bipolar code with a specific zero suppression scheme where no more than three consecutive zeros are allowed to occur. The HDB3 line code is recommended for 2.048 Mbps signals by ITU-T Recommendations G.703, and it is defined in Annex A to Recommendations G.703. In some instances, straightforward bipolar AMI (Alternate Mark Inversion) coding with no zero suppression is also encountered. In the following paragraphs, we will first review the AMI coding format, which represents the simplest version of bipolar line code. We will then move on to explaining the 2.048 Mbps HDB3 line code, which essentially is a variation of AMI where a high density of pulses is ensured by applying a zero suppression algorithm. In the AMI coding format, a binary one (mark) is represented by a square pulse with a 50% duty cycle and a binary zero (space) is represented by the lack of pulse, i.e., 0 Volts. Since successive pulses (i.e., marks) alternate in polarity the line code is termed AMI (Alternate Mark Inversion). Despite its numerous advantages, AMI coding has one very significant shortcoming. Since signal transition is the only way for 2.048 Mbps equipment to recover the timing information, long strings of zeros with no pulse transition in the data stream may cause the equipment to lose timing. Hence AMI coding puts strict limitations on the zero content of the data transmission in the 2.048 Mbps system. One solution to this problem is to use a coding scheme that suppresses long string of zeros by replacing them with a specific sequence of pulses, which can be recognized and decoded as zeros by 2.048 Mbps equipment. HDB3 is one such coding scheme upon which the 2.048 Mbps industry standardized. The HDB3 signal is a bipolar signal, where sets of 4 consecutive zeros are replaced by a specific sequence of pulses and the last pulse is coded as a violation. This ensures that the 2.048 Mbps signal has a high density of pulses and no more than 3 consecutive zeros. The 4th zero is always coded as a violation pulse. The 1st zero may be coded as a “balancing” pulse to ensure that successive HDB3 violation pulses are of opposite polarity so that the net DC component of the signal remains zero. Hence the HDP3 code eliminates all the limitations on the zero content of the signal transmitted in the 2.048 Mbps system while preserving all the advantages of AMI coding. The 2.048 Mbps signal typically consists of multiplexed data and/or voice which requires a framing structure for receiving equipment to properly associate the appropriate bits in the incoming signal with their corresponding channels. The figure shows the framing for the 2.048 Mbps signal as defined in ITU-T Recommendation G.704. As can be seen in Figure, the 2.048 Mbps frame is broken up into 32 timeslots numbered 0-31. Each timeslot contains 8 bits in a frame, and since there are 8000 frames per second, each time slot corresponds to a bandwidth of 8 x 8000 = 64 kbps. Time slot 0 is allocated entirely to the frame alignment signal (FAS) pattern, a remote alarm (FAS Distant Alarm) indication bit, and other spare bits for international and national use. The FAS pattern (0011011) takes up 7 bits (bits 2-8) in timeslot 0 of every other frame. In those frames not containing the FAS pattern, bit 3 is reserved for remote alarm indication (FAS Distant Alarm) which indicates loss of frame alignment when it is set to 1. The remaining bits in timeslot 0 are allocated in Figure. Note: Even numbered frames contains the FAS pattern in time slot 0. If the 2.048 Mbps signal carries no voice channels, there is no need to allocate additional bandwidth to accommodate signaling. Hence, time slot 1-31 are available to transmit data with an aggregate bandwidth of 2.048 Mbps – 64 kbps (TSO) = 1.984 Mbps. The 2.048 Mbps can carry up to thirty 64 kbps voice channels in time slot 1-15 and 17-31. However, the 8 bits in time slot 16 are not sufficient for all 30 channels to signal in one frame. Therefore, a multiframe structure is required where channels can take turns using time slot 16. Since two channels can send their ABCD signaling bits in each frame, a total of 15 frames are required to cycle through all of the 30 voice channels. One additional frame is required to transmit the multiframe alignment signal (MFAS) pattern, which allows receiving equipment to align the appropriate ABCD signaling bits with their corresponding voice channels. This results in the TS-16 multiframe structure where each multiframe contains a total of 16 2.048 Mbps, numbered 0-15. Above Figure shows the TS-16 multiframe format for the 2.048 Mbps signal as defined by the ITU-T Recommendation G.704. As can be seen in Figure, time slot 16 of frame 0 contains the 4-bit long multiframe alignment signal (MFAS) pattern (0000) in bits 1-4. The “Y” bit is reserved for the remote alarm (MFAS Distant Alarm) which indicates loss of multiframe alignment when it is set to 1. Time slot 16 of frames 1-15 contains the ABCD signaling bits of the voice channels. Time slot 16 of the nth frame carries the signaling bits of the nth and (n+15) th voice channels. For example, frame 1 carries the signaling bits of voice channels 1 and 16, frame 2 carries the signaling bits of channels 2 and 17 etc. 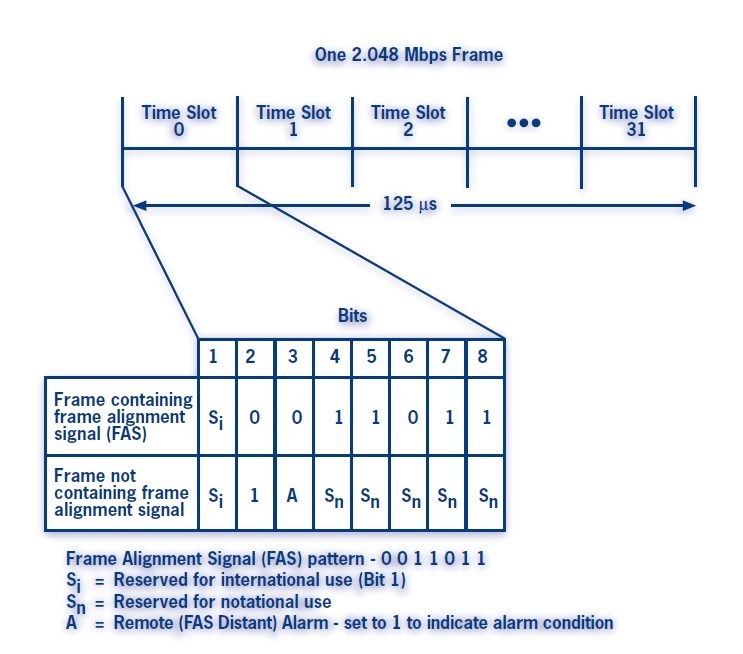 It is also important to note that the frame alignment signal (FAS) is transmitted in time slot 0 of the even-numbered frames. We have thus explained how frame alignment and channel associated signaling are achieved in 2.048 Mbps transmission. (Alternatively, time slot 16 may also be used for common channel signaling applications such as primary rate ISDN). It must be noted, however, that the 2.048 Mbps framing and TS-16 multiframing structures discussed so far do not provide any built-in error detection capabilities, which could be used to determine the error performance of the 2.048 Mbps system on an in-service basis. This capability is provided by the CRC (Cyclic Redundancy Check) multiframe structure as explained in the next section. This section describes the specifics of the 2.048 Mbps CRC Multiframe format. The CRC Multiframe consists of 16 frames (numbered 0-15) which are divided into two sub-multiframes (SMF-1 and SMF-11) of 8 frames each. The 4-bit long CRC word associated with each submultiframe, SMF(N) is inserted into the next sub-multiframe, SMF(N+1). The CRC bits take up the 1st bit of time slot 0s containing the 7-bit FAS (Frame Alignment Signal) pattern. The CRC Multiframe alignment signal uses the 1st bit of time slot 0s not containing the FAS pattern. Cannot use the publicly switched network. No voice transmission with TS-16 signaling possible. No error performance monitoring via CRCs. Voice transmission with TS-16 signaling and error monitoring possible. The table gives a comparison of the possible variations of a 2.048 Mbps signal.